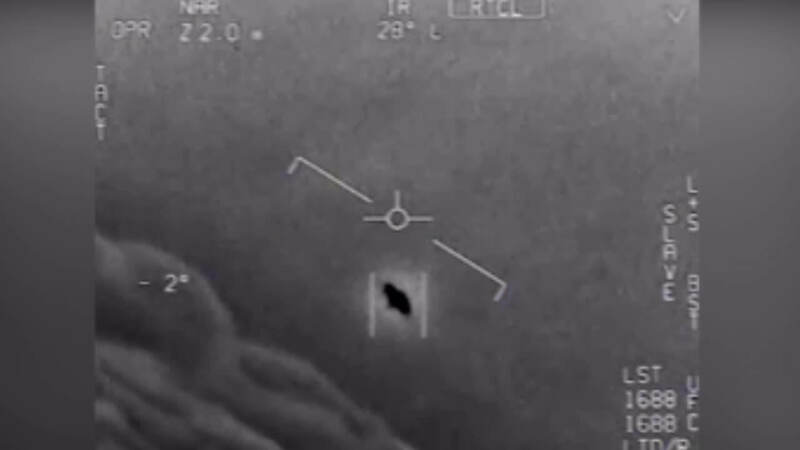 THE Pentagon ran a multi-million dollar UFO program for years and now footage of US jets encountering an unexplainable object has confirmed it. Leaked records appear to show the US government was secretly investigating reports of aircraft moving at “very high velocities with no visible signs of propulsion, or that hovered with no apparent means of lift”. Videos of such sightings have been released in recent months – such as one in November showing a bizarre white object being chased by two Navy F/A-18F fighter jets. And even more baffling footage has now surfaced which appears to show a UFO surrounded by a “glowing aura” rotating mid-air in front of US Navy jets. As the mystery object soars across the skies, the watching pilots can be heard voicing their amazement. “There’s a whole fleet of them, look on the S.A.” one says. The Advanced Aerospace Threat Identification Program – as it was known – had a budget of $22million (£16.5million) allocated to it annually by the Defense Department and was run on the fifth floor of the Pentagon’s C Ring. It was the brainchild of former Nevada Democrat Senator Harry Reid, who pushed for its creation in 2007. Reid – whose region of control extended over the infamous Area 51 – tweeted yesterday evening: “The truth is out there, seriously. “This is about science and national security. If America doesn’t take the lead in answering these questions, others will.”According to the New York Times, the Defense Department ended funding for the programme in 2012 and shut it down. “It was determined that there were other, higher priority issues that merited funding, and it was in the best interest of the DoD to make a change,” a Pentagon spokesman, Thomas Crosson, said in an email.